The international community considers continuing settlement growth in the West Bank a major obstacle to peace. JERUSALEM: US President Donald Trump's special envoy Jason Greenblatt and Israeli Prime Minister Benjamin Netanyahu discussed ways to reach peace with the Palestinians as well as settlement construction, a statement said Tuesday. The five-hour meeting, held in Netanyahu's Jerusalem office late Monday, came as Trump's administration begins to enter the decades-old Israeli-Palestinian conflict. The two "reaffirmed the joint commitment of both Israel and the United States to advance a genuine and lasting peace between Israel and the Palestinians that strengthens the security of Israel and enhances stability in the region," a joint statement from the premier's office and US embassy said. They also "continued discussions relating to settlement construction in the hope of working out an approach that is consistent with the goal of advancing peace and security." According to the statement, Greenblatt "reaffirmed President Trump's commitment to Israel's security and to the effort to help Israelis and Palestinians achieve a lasting peace through direct negotiations." Greenblatt was due to meet Palestinian president Mahmud Abbas in Ramallah in the occupied West Bank on Tuesday. The statement cited Netanyahu as telling Greenblatt he believed "it is possible to advance peace" while Trump is in the White House. Greenblatt himself wrote on Twitter that he had a "very positive and productive meeting" with Netanyahu during which they discussed the "regional situation, how progress towards peace with Palestinians can be made & settlements." At a White House meeting in February, Trump asked Netanyahu to "hold back on settlements for a little bit." But Netanyahu has found himself caught between maintaining relations with Washington and holding together his right-wing governing coalition, with some pushing for immediate action. On Tuesday, pro-settlement members of the coalition were seeking to advance a bill to annex a large Israeli settlement east of Jerusalem of some 37,000 people called Maale Adumim. The bill was on the agenda for a ministerial committee meeting later Tuesday. Amid warnings that such unilateral moves could lead to a crisis with Trump's administration, Netanyahu has reportedly been seeking to delay the bill. A source familiar with the discussions told AFP the coalition chairman wants to put off the vote by three months, but Education Minister Naftali Bennett of the hardline Jewish Home party is only willing to agree to a one-week delay. On Friday, Trump invited Abbas to visit the White House "soon" to discuss ways to resume the peace process. 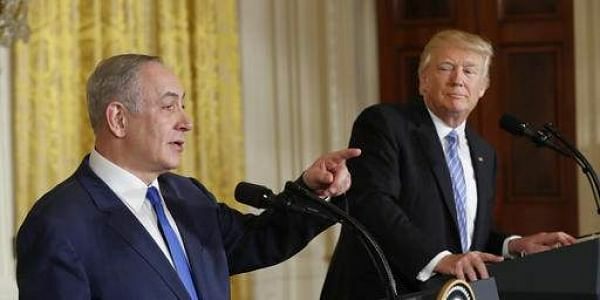 When Netanyahu met with Trump at the White House last month, the US president broke with decades of US policy by saying he was not bound to a two-state solution to the conflict. The US State Department had on Monday described Greenblatt's visit as an orientation trip to enable him to get a sense of how "we can create a climate that leads to eventual peace negotiations". Spokesman Mark Toner said the trip was "the first of what will become many visits to the region."